Model Pagoda Model PAGODA is a light weight galvanized tensile structure having the feasibility to install & remove along with modules coupling . In this structure, the steel frames are visible from outside. TRIGON STRUCTURES provides pagoda tent for sale under standard sizes available in 3.30 mt x 3.30 mt, 4.30 mt x 4.30 mt, 5.20 mt x 5.20 mt, and 6.30 mt x 6.30 mt specifications. It has a load bearing galvanized steel frame, powder coated, available in various colors on request. The top roof is made of fire retardant PVC polyester coated fabric subjected to PVDF protection treatment. Broadly used for outside commercial premises, summer hotel pavilions, restaurants, parking’s, warehouses, trade fairs and festivals. etc. 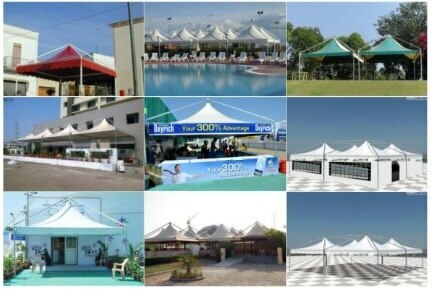 For a custom size pagoda tents, request for a free cost estimate today.